Sacramento Republic FC drop their first match of the USL 2015 season following six second-half goals, including four for S2. The match started slowly for both sides, which is not unheard of for the first match of the season. Republic FC soon got into a rhythm and became the stronger side for the remainder of the half, constantly challenging the S2 defense. In just the 3rd minute, Republic FC saw one of their best chances when newly signed forward David Estrada found a streaking Gabe Gonzalez on the right side of the box. Gonzalez sent a quick cross to the back post where Justin Braun was waiting, but the cross went just over his head. Republic FC were at it again in the 22nd minute, when Estrada found James Kiffe wide open in the middle of the field. Kiffe balanced himself at the left corner of the box and took a strong shot that beat the keeper but skipped harmlessly off the side netting. The match was scoreless at the half. The second half began quick and stayed that way. In the 49th minute, S2 struck first when forward Andy Craven received the ball in the middle of the field from Damion Lowe. Craven took the ball down then fought off Republic FC defender Mickey Daly before flicking a chip shot over a leaping Patrick McLain, putting S2 up 1-0. 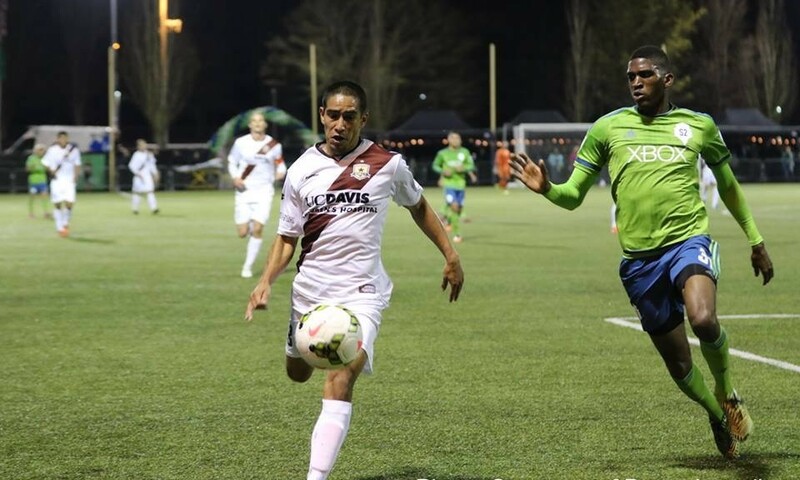 Republic FC seemed energized by the goal and found the equalizer in the 64th minute. Midfielder Octavio Guzman took a corner for Republic FC that was deflected back to him. Guzman then sent the ball back in front of the net where it was deflected a few more times before finding Braun at the top of the box. Braun sent a low liner into the bottom left side of the net to even the score 1-1. Just six minutes later, forward Sam Garza subbed on for S2 and on his first touch of the match put S2 ahead 2-1. Garza received a pass near the middle of the field from Pablo Rossi, chested the ball down then fired a shot past McLain. Five minutes later S2 struck again, this time off a free kick. In the 74th minute Republic FC defender Kiffe received a yellow card, setting up a free kick about 25 yards out. In the 75th minute Rossi stepped up and sent the free kick bending over the wall and into the upper left corner of the net putting S2 ahead 3-1. In the 89th minute S2 would find the net for the fourth and final time of the night when midfielder Victor Mansaray beat the Republic FC defense down the left side of the field. Mansaray then send a low cross to Cristian Roldan at the right side of the box who sent the ball past McLain, putting S2 up 4-1. One minute into stoppage time Republic FC would salvage a final goal from a free kick. Guzman stepped up to the ball from about 5 yards outside of the box and sent a knuckleball the outsretched hand of Charlie Lyon and into the top right corner of the box. The match would end with a score of 4-2 in favor of S2. Republic FC will be back in action on Saturday, March 28 when they take on LA Galaxy II at the StubHub Center in Carson, Calif. Kickoff is 7:30 p.m. Match will be stream live at SacRepublicFC.com/matchday. Sacramento Republic FC – Patrick McLain; Emrah Klimenta, Mickey Daly, Derek Foran, James Kiffe; Octavio Guzman, Ivan Mirković, Gabe Gonzalez, Joaquin Rivas (Cameron Iwasa 72); Justin Braun, David Estrada (Adnan Gabeljic 84). Subs Not Used: Dominik Jakubek, Gabe Gissie, Alfonso Motagalvan. Stats: Shots: 8, Shots on Goal: 2, Saves: 3, Fouls: 15, Corner Kicks: 5, Offside: 2. Seattle Sounders FC 2 – Charlie Lyon; Oniel Fisher (Aaron Long 45), James Ockford, Damion Lowe, Dylan Remick; Victor Mansaray, Amadou Sanyang (Cristian Roldan 63), Giuliano Frano, Aaron Kovar (Sam Garza 69); Pablo Rossi (Darwin Jones 86), Andrew Craven (Duncan McCormick 75). Stats: Shots: 12, Shots on Goal: 7, Saves: 0, Fouls: 9, Corner Kicks: 3, Offside: 2.